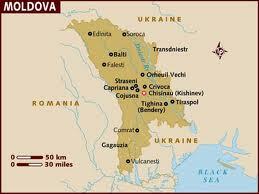 Located in eastern Europe, Moldova is a landlocked country that shares it's borders with Romania and Ukraine. In 1991, Moldova declared independence as part of the dissolution of the Soviet Union. A strip of the Moldova's internationally recognized territory on the east bank of the Dniester River, has been under de-facto control of a bureaucratic government of Transnistria since 1990, but hopes to become part of the European Union. Moldova's cuisine can be described as traditional European food, using beef, pork, potatoes, cabbage and cereal as the basis of it's dishes. The country's fertile black soil is ideal for growing grapes, fruit and vegetables and supports live stock who produce milk used in many different types of cheeses. Moldovan agriculture is highly regarded for it's use of traditional farming methods that produce ecologically clean food. Traditions that influence Moldova's cuisine includes Ukrainian, Bulgarian, Gagauz, Lithuanian, Russian, Turkish and Greek flavors. With a sharp knife, make deep slits all over the meat and insert the garlic slivers, as deep as possible, into the slits. rub the meat with salt and pepper. Melt 2 tablespoons of the butter in a large casserole over medium heat. Add the meat and brown it on all sides. Off the heat, spread the mustard over the meat with a spatula. Add the onions, Italian pepper, tomatoes, celery and stock to the casserole. Sprinkle the meat and vegetables with 1/2 teaspoon of the paprika and roast for 1 hour, turning the meat, and basting with the pan juices from time to time. Prick the meat with a meat with a fork; when the juices run clear, the meat is done, but do not over cook. Remove the roast from the casserole, place on a cutting board, and cover with foil. Strain the pan juices and skim off the fat. Puree the vegetables in a blender. Add the puree to the pan juices. Melt the remaining 1 tablespoon butter in a small heavy sauce pan over medium heat. Sprinkle in the flour and stir for 2 minutes. Whisk in the pan juices. Add the wine, lemon juice, minced garlic, thyme, parsley and additional salt and pepper. Bring to a boil, then reduce the heat to low and simmer, covered for about 10 minutes. Stir in the mushrooms and the remaining paprika and simmer for 5 minutes more. Carve the pork into thin slices and arrange on a serving platter, Pass the sauce separately in a sauce boat. Combine the water and salt in a heavy sauce pan and bring to a boil. Add 2 tablespoons of the cornmeal in a steady stream and whisk until the water returns to boiling. Next add the rest of the cornmeal, stirring constantly. Reduce the heat to low and cook the mixture, covered until thickened, about 10 minutes. Add the butter, a piece at a time, stirring constantly. Continue stirring until the mixture leaves the sides of the pan, about 5 minutes more. Transfer to a medium sized oval bowl and flatten the surface with a wet spoon. Let stand 5 minutes. Invert the mamaliga onto a plate and sprinkle with parsley. Final Assessment: This was great meal and would be perfect for a dinner party or family gathering. I wouldn't suggest planning it unless you have some time, as it takes some preparation beyond what one would reasonably expect to jump into on a week night. The sauce, which I understand Moldovan's love, made the meal. Pureeing the vegetables released all their glorious flavors and roasted-sugariness that was plate-licking good. And, anything with mushrooms is boss. Did someone mention roast pork??? ...and mushrooms! Love the dish! It was a fun night. The dish was awsesomesauce and...so was the beer :) Thanks for stopping by to visit!